In the past week, reporters, dog lovers and researchers have gotten jazzed by the news that dogs are more likely to interact with a social “PeopleBot” than one that is not. Frankly, I would do the same myself. The PeopleBot in this study was even directing the dog to a bucket of food. From a dog’s perspective, what’s not to like here? Here’s the 411: Researchers at the Hungarian Academy of Science and Eötvös Loránd University took 41 dogs and divided them into two groups. Both groups were exposed to the PeopleBot robot — essentially a screen on top of a human-sized platform with wheels. Two arm-like things wearing four-fingered gloves dangle from the sides of the platform. 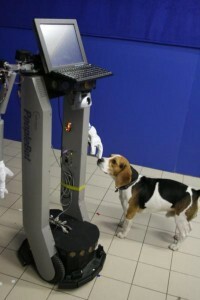 Each each dog in each group watched their owner interacting with the robot before leaving the room. In one group, the robot was “social” — whatever that means in the context of a TV screen with arms. The other was not. When the human left the room, the robot and the dog were observed. The social robots might talk to the dog or call it by name. In both groups, the robot pointed to one of two buckets that held food. While the dogs had difficulty understanding the pointing, those with the social bot were more likely to go to the bucket with the food. All I have to say is this: you don’t go from a hungry wolf to an old lady’s lap dog without learning a few things along the way — like being observant. Or flexible. 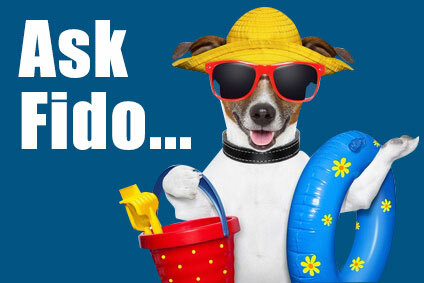 Or making nice about oddball requests if there’s food involved. Some researchers have concluded that the study points future roboticists toward designing interactive robots some degree of socialness. REALLY?!! They needed a dog for that? Dogs, cats and critter bots, oh my! The reporting of dogs interacting with robots reminds me of seeing a shelf of stuffed toy cats curled up in pillowed baskets in a hospital pharmacy gift department. As I got closer, I saw the cats’ sides were rising and falling as if they were breathing. It took several minutes to understand what I was seeing — battery-powered toys. Hardly interactive, but absolutely mesmerizing. It’s interesting that while the Hungarian researchers chose dogs to study because they had no preconceptions about robots, the Boston Dynamics team chose to call their intimidating machine “BigDog” when we humans have so many positive preconceptions about dogs. And, Jason, if you don’t have a backyard, check out Boston Dynamics’ LittleDog. LittleDog is being used at universities ranging from the Massachusetts Institute of Technology (MIT) to the University of Southern California (USC).